Five episodes of GTO? How can you go wrong with that? 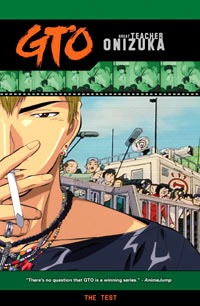 Covering the events of the 7th volume of the manga, Great Teacher Onizuka Vol.4 picks up with Onizuka hot on the trail a group of kidnappers who've taken Hidemi hostage. Heroically, Onizuka cracks some skulls, rescues the grateful snot-nosed brat, and rushes to school to take a test that'll decide if he can remain a teacher. Over the top, yes, but fans wouldn't have it any other way. Onizuka pulls off a miracle and finishes the entire test in just an hour, only to fall over from blood loss. Yes, blood loss. It seems he was shot by the kidnappers and by sheer force of will lasted as long as he did. The media and an onslaught of reporters show up outside of Holy Forest Academy when the story of the kidnapping breaks. Five jam-packed episodes of Onizuka goodness, and things only manage to get even hotter when Urumi Kanzaki, the teacher killer, shows up to make Onizuka her own personal slave. Ah, blackmail is such a wonderful thing. It's a shame it has to happen to such a wonderful teacher. After four volumes, some of the supporting characters' voices don't seem to fit as well as they once did. Regardless of that, they do add to the overall nature of the scenes rather than detract from it. In fact, the dub is one of those that you can sit at your computer and listen to and instantly know what's happening in the show. In terms of extras, this volume contains a sweet one. It's got the first part of an interview with GTO's creator Tohru Fujisawa. And it's not just a simple text interview; it's an actual in-person interview. You get to see Fujisawa eat, drink, and talk about his life and manga. It's one of those rare informal treats that really give some insight into the story behind the series. Other extras include textless opening and closings, character sketches, and previews. Also, the DVD insert contains a list of Japanese words along with translation notes for them. Also of note is that this volume has new opening and closing credit sequences. Do yourself a favor and don't skip these. Personally I prefer the former 'Driver's High' opening over the new 'Hitorino-Yoru' sequence, but the new opening does usher in a nice new era for the series. Call it evolution, and this show just keeps getting better.